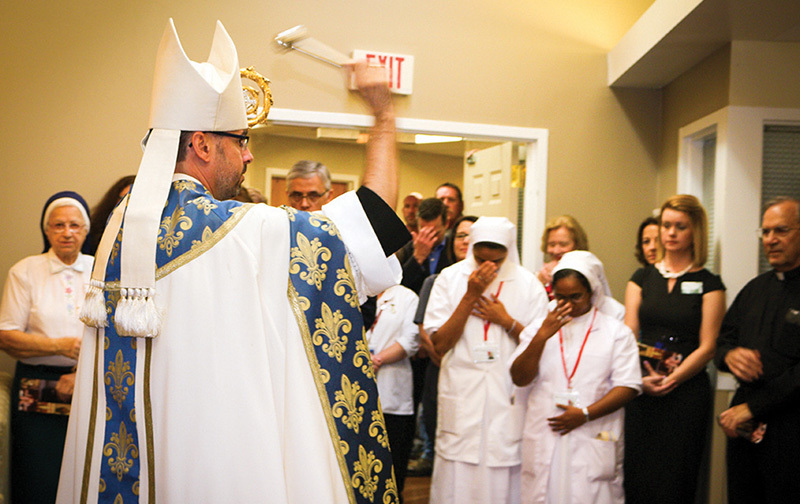 Abbot James Albers, OSB, blesses the newly dedicated St. Benedict and St. Scholastica Memory Care Neighborhood at Villa St. Francis in Olathe. OLATHE — Members of Villa St. Francis and St. Benedict’s Abbey families gathered at the Villa here on Nov. 10 to celebrate the dedication of the newly updated St. Benedict and St. Scholastica Memory Care Neighborhood. Abbot James Albers, OSB, made the trip from St. Benedict’s Abbey in Atchison to bless the neighborhood, which was renamed in honor of the partnership between the Villa and the abbey. The monks of the abbey donated framed prints of photography taken around their campus, which now adorn the walls of the neighborhood and serve as a constant reminder of faith and an opportunity for reflection and prayer. “St. Benedict’s Rule talks about the many individuals who come to us as Christ,” said Abbot James in his blessing, “but he says the ones that are most prominent to us as Christ are the sick and infirmed. Founded by the Sisters of Charity in 1944, Villa St. Francis is a nonprofit skilled nursing community in Olathe sponsored by the archdiocese. With daily Mass, nuns from the Sisters of St. Joseph and St. Ann’s Convent on staff, and Msgr. Raymond Burger residing right on campus, the Villa’s dedication to providing faith-based service is prominent in the day-to-day life of the community. The St. Benedict and St. Scholastica Memory Care Neighborhood is home to 46 of the Villa’s more than 160 residents, and recent updates have served as a testament to the community’s mission and its focus on creating a true home for those who live there. The group also celebrated Frank Purdome, a longtime volunteer and friend of the Villa, who passed away earlier this year. Joined by Purdome’s friends and family, Villa St. Francis CEO Rodney Whittington announced the “Frank Purdome Memorial Courtyard” in honor of his years of service and dedication to the community and its residents. The courtyard is securely situated between St. Benedict and St. Scholastica halls, and offers a peaceful and prayerful retreat for the Villa’s memory care residents. After the dedication ceremony, friends, family members and supporters of the Villa enjoyed a celebratory reception and tours of both the neighborhood and the courtyard.